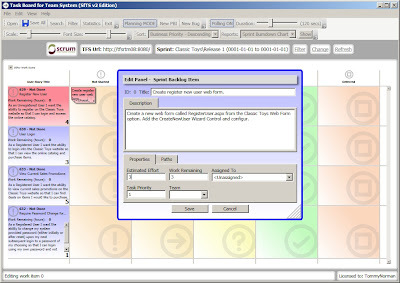 take a look on ScrumDesk , please. Task board is accessible too and December version will enhance this feature. 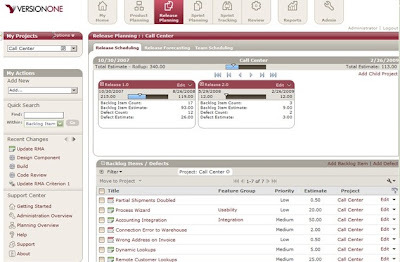 Capacity planning, drag and drop, reports and many other features are included of course. To synchronize Microsoft Team Foundation with ScrumDesk you can use our Synchronization Hub. I took a look at the screen casts and it looks very interesting. The TFS integration looked simple and the cost point seems reasonable. Signed up for a trail copy and just waiting for the email. Thanks for pointing this out. Can't wait to try it. We're glad you like our Task Board. We're currently working on WPF based Product Owner tools - that will, among other things, allow for far easier and intuitive release planning using your TFS data. I can't promise we'll "rip off" Version One, but we have some pretty good ideas of our own. We're expecting to go into public Beta in Q1 2009, so if you're interested in getting early access, drop us a line. I guess I should choose my words more carefully! :) Let's say "creatively reimagine". I would be very interested in seeing what Conchango is working on in the Product Owner area. I am in touch with Crispin, should I just give him a shout to get involved early? 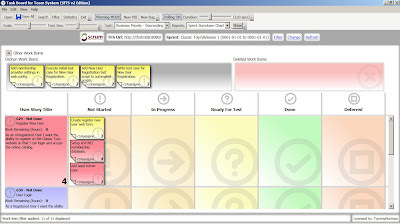 As I tell you at the Agile 2009 conference, Urban Turtle have a really good application for release planning, sprint planning and a good task board for day to day work. We just release version 2.0 with the concept of area and still working on the 2010 version that will be ready for the launch March 22 2010 ! If you have a chance to try it and send me some comments that will be really great.